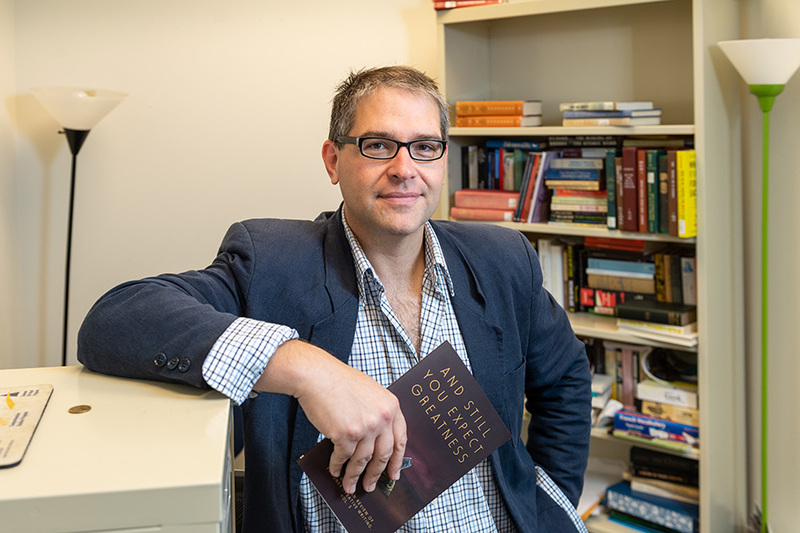 This week, meet Phil Christman, a Lecturer of English on Ann Arbor campus. Phil is the Ann Arbor Campus Co-Chair (alongside Erin Lavin) and was previously a member of Communications Committee. Read about Phil’s experience with union activism below, and let us know if you’re interested in getting involved in a union committee here! Men Without Hats, "The Safety Dance (Extended Mix)"
Well, when I was a kid my family gave me to understand that unions were associated, in a general way, with thuggery, laziness, and Stalinism (somehow all at the same time). I got over that though. I was on the Communications Committee last year and have been on the UC both of the last two years. When I rotate off the UC, I'm looking forward to rejoining Comms, where the meetings have wine and people are fun. Being on the UC is an incredibly fast and efficient way to learn a whole lot about the internal politics of your university, your state, and also, of course, your union. This is intellectually fascinating and, in the snakepit that is the neoliberal corporate university, potentially life-saving. As for comms: see above, in: re: wine. The abolitionists. I'm reading old abolitionist writings and secondary sources because I believe that, due to climate change, we need to fundamentally change the structure of this society very quickly, if we wish to survive at all. The abolitionists were basically a) a bunch of marginalized black people who objectively had no chance whatsoever plus b) some white dorks who wrote pamphlets and checks. Yet this hopeless coalition effected just such a fundamental change, over more or less that timeframe. They rule. They are the coolest, most interesting, badass people, and about the only bright spot in this country's disgusting history. The 22nd, I suppose. I don't want to live in any era when I'd have to smell bad all the time. Sorry, history. I would follow my lord and savior Godzilla to the ends of the earth and back. My getting-through-the-Trump-era bookbag consists so far of the following. I'm reading the collected works of the late Mark Fisher right now--the compilation, like his blog, is called K-PUNK. It's a mixture of political writing and music and literary criticism and it is the truest, most exactingly accurate description of contemporary life that I have ever read. I feel more or less the same way about INFINITY TO DINE, an essay collection by a writer who goes by the name "lazenby." I also really loved Meghan O'Gieblyn's recent book about the Midwest, INTERIOR REGIONS. I love everything Tressie McMillan Cottom writes, and everything B.D. McClay writes. Post-2016, I find myself returning a lot to the "Who Stands Fast" section of Dietrich Bonhoeffer's LETTERS AND PAPERS FROM PRISON (about which I feel more or less as I feel about the abolitionists). Finally, George MacDonald's UNSPOKEN SERMONS keeps me sane. The one that allowed me to proselytize for Mark Fisher.